Prepared for competitive action, hit the gym or the road in style when you pull on these impressive Challenger 2 In 1 Training Shorts from Nike in Black and Black. 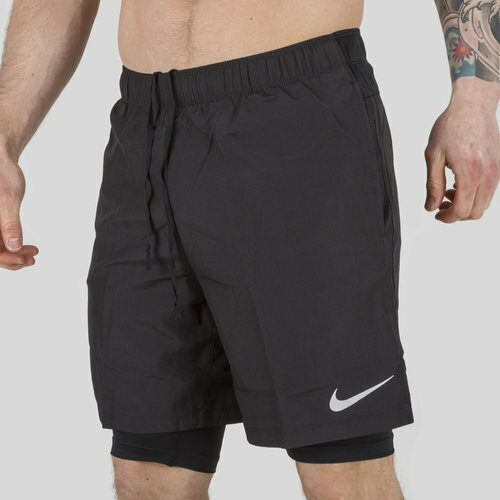 These mens training shorts have been designed to raise your performance levels whether in the gym, on the training field or out and about road running, the Nike fabric as always is lightweight and breathable and in combination with Nike's impressive Dri-Fit technology which wicks sweat and keeps you cool and comfy. The two in one design combines a four-way stretchy fabric which offers support to the upper legs with the outer layer providing coverage in any conditions.